The size of the power sat is awesome, primarily because normally space payloads are throught of as being fully assembled on Earth and then launched into space. Skyscrapers, dams, or nuclear powerplants would be equally awesome if they were thought of as being transported, fully assembled, from one place to another on Earth. Powersat parts and subassemblies would be transported to a low Earth orbit, similar to the Skylab orbit, in hundreds of flights of a low-cost space freighter, shown in comparison with the Apollo-Saturn moon rocket. The freighter would burn nonpolluting hydrogen fuel as did the Saturn upper stages. Its “fat Albert” shape provides a large-volume payload bay and enables controlled aerodynamic return to Earth and a rocket-arrested soft landing. The freighter shown has been sized for 226 796.2 kilograms (250 tons) of payload and would use space shuttle engine technology and a watercooled heat shield to achieve total reusability and a ground handling time between flights of less than 1 day. The destination of the space freighter is an assembly station in space, manned by a construction crew. In the zero gravity of orbit, the lightweight structure of the powersat can be safely deployed with a minimum of effort and all the parts can be installed, connected, and checked out. Completed power generation modules would be efficiently transferred to a stationary orbit at 35 405.6 kilometers (22 000 miles) by electric rockets drawing electric power from the modules. The low thrust of the electric rockets would not overstress the lightweight structure and could effect the transfer in about 3 months. 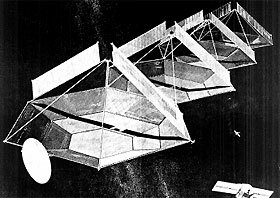 Small conventional rockets would assist the electric rockets in keeping the power module pointed at the Sun. The electric rocket engines and their controls would be returned to the assembly station to be used again and again. Final assembly of the powersat occurs in the operational orbit by joining the modules together and attaching the microwave transmitter, transported by one of the power generation modules, at its operating position. The power transmission system must efficiently move the electric energy obtained from the Sun over 35 405.6 kilometers (22 000)miles of space to the Earth’s surface for use. Efficiency is critical. To maintain the same useful power output on the ground if transmission efficiency is reduced 10 percent, the entire powersat must be made 10-percent larger. The transmission system would use amplitron radiofrequency generators much like microwave oven tubes, and a wavelength of approximately 12.7 centimeters (5 inches). Maximum beam strength at the center of the receiving antenna is approximately 484.4 W/m2 (45 W/ft2 ). At the antenna edge, the beam strength is well below public exposure standards.